During the weekly clubs period, Upper School students prove that learning isn't limited to the classroom by brushing up on their skills and expanding their interests at one of more than 30 student clubs. New to this year's offerings is the Culinary Club. 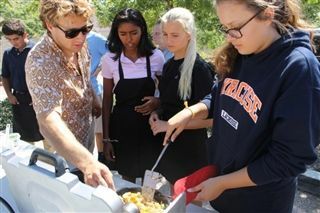 Led by Upper School English teacher and San Diego Culinary Institute graduate Tom Nagler, Culinary Club members are learning the foundation of cuisine by building complex flavor profiles in dishes, exploring how ingredients complement one another, practicing proper sanitation, and mastering the basics of food prep. Students hope to share their newfound knowledge through the creation of a Culinary Club journal that includes food photography, recipes, chef bios, and restaurant reviews.